Social media commerce means you connect with customers and potential customers through websites and e-mail. Just remember, deleting e-mails to save time is the modus operandi for web-connected folks in business these days. Some companies feel they have a right to send daily deals and brass-band-accompanied promotions. Is it even possible for a business to have that many sales that they need to contact customers daily? Admittedly, the blame for the bulk mail in your inbox falls on you. When you’re ordering online, often a bit of tiny text next to a prechecked box says something like “Keep me posted on new products and sales,” and you forget to deselect it. How important can your message be to your customer that you have to e-mail them every day? Deleting e-mails can become rote. Instead of e-mailing your customers daily, why not reach out to them when you have an offer that stands out from the crowd? A weekly deal on a specific product or service would be appreciated by regular and new customers. Vary your messages and layout; send readable content as well. Give your customers a reason to want to open your e-mails. There are experts who claim the more e-mail the better — that is, sending frequency doesn’t affect the unsubscribe rate. The data on both sides of the argument is conflicting. What isn’t taken into consideration is that many people use filters to get rid of commercial e-mails or just delete without unsubscribing. The chart in the figure from eMarketer.com shows some important statistics derived from a March 2012 study. Note that the number-one reason why people subscribe is to receive discounts, followed by taking part in a specific promotion. Discounts are a known draw, but creative promotions on a Facebook page or a social media network are where your newest customers find you. 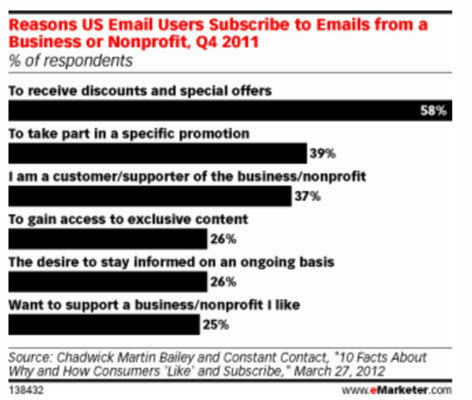 Reasons for subscribing to e-mails from a business or nonprofit. From the same study comes this telling statistic: 69 percent of U.S. e-mail users unsubscribe from a business or nonprofit e-mail because the organization sends too many e-mails. The amount of monitored “opens” tells the story of whether your message is getting through to your audience. Be sure your e-mail opens can be tracked. This also lets you know which e-mails are resonating with your customers. Give your customers some credit. If they were kind enough to give you permission to connect with them through e-mail, why would you abuse the privilege? Your e-mails need to carry meaning and value.